A work of public art will commemorate the literary heritage of “Little Syria,” a once-bustling Downtown Arab community—the city’s first—that was centered along Washington Street. Dozens of people packed a room in the Metropolitan College of New York on West Street late last month to listen to the proposals of four artists vying for the commission, to be installed in a future redesigned Elizabeth H. Berger Plaza at Trinity Place and Edgar Street. In light of President Trump’s executive order indefinitely suspending Syrian refugees to the U.S. and a 90-day ban on people from seven largely Muslim countries, the honoring of Arab-American immigrants took on added meaning. “While we have people on the federal level challenging our culture and our history and where we come from, we will be included and given a platform in New York City to actually be able to celebrate our culture,” Debbie Almontaser, founder of the Kahlil Gibran International Academy, the country’s first Arabic language dual language public school, said at the meeting. 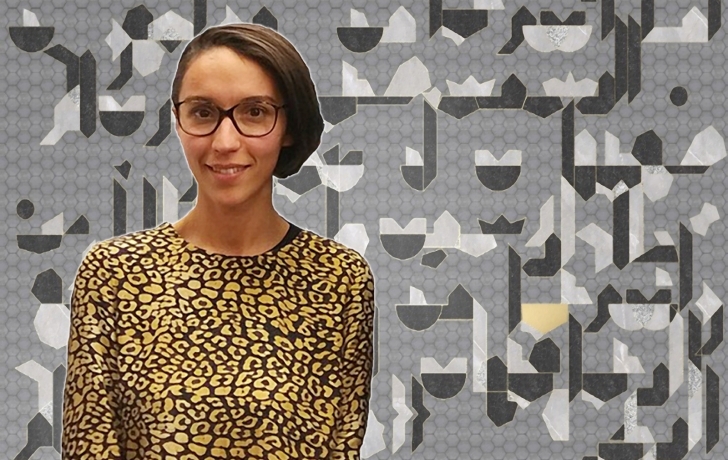 Following presentations by the artists and responses from the audience, a panel of city officials and experts in Arabic culture voted overwhelmingly for a proposal by French-Moroccan artist Sara Ouhaddou. Her plan calls for inventing what she calls “a new alphabet for the park.” The artist would create an Arabic script restyled in a contemporary way. The letters, shaped together in geometric patterns found in the Islamic world, would be embedded throughout the park. Quotations and lines of poetry from Arab-American writers would be engraved on brass pavers. Ouhaddou, 30, said she was not considering politics as she worked on her proposal. This new recognition of Little Syria’s literary past is the dream come true of Todd Fine, a PhD history student and scholar of Ameen Rihani, one of the Arab-American writers who will be commemorated. Six years ago he began goading the city to erect a monument to Little Syria’s literary past and joined others in trying to preserve the old neighborhood’s three surviving buildings. (The neighborhood was largely demolished in the 1940s to make way for the Brooklyn Battery Tunnel.) The monument effort got a toehold in the park in 2013 when the organization he founded, the Washington Street Historical Society, raised funds to repair six Superstorm Sandy-damaged benches in the plaza. The group placed plaques on the benches, each with a quote that honors Arab-American culture. It would take continued “nagging,” as he put it, as well as support from Councilwoman Margaret Chin and Community Board 1, to convince the city to put a commemorative piece in the park. Fine said he wants to distance the public art project from current political controversies. The writers to be honored, Rihani, Kahlil Gibran and Elia Abu Madi, among others, dealt with “thousand-year-old questions,” he observed, that transcend politics.